For athletes and adventurers who want to do more, not wear more - Fenix 5S is the perfect fit. The premium multisport watch that offers full-size performance in a lighter, sleeker, more compact design. 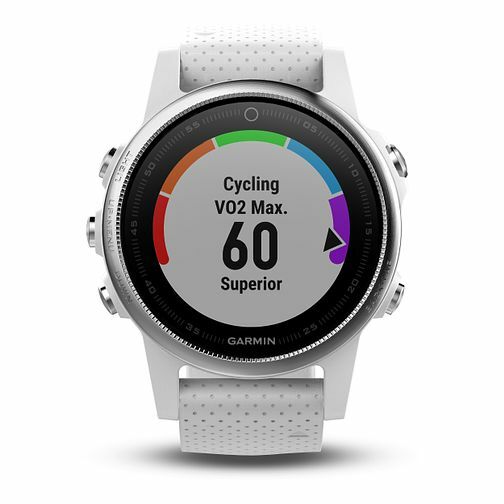 You can beat yesterday with advanced features such as wrist-based heart rate, built-in activity profiles, basic navigation functions, and performance metrics that lets you better measure the effectiveness and progress of your training. Because one size does not fit all, the Fenix 5S with a 42mm watch diameter has been optimised to perfectly fit athletes with narrower wrists while providing all the advanced sport features that Fenix is known for. Fenix 5S features a sleek athletic design and superior quality feel with a stainless steel EXO-Antenna bezel and a forged steel back to guarantee performance in the most demanding of environments (water-rated to 100 meters).